Spend another £22.33 to get FREE DELIVERY! Centrifugal 100mm bathroom extractor fan with integral filter. Single Speed with Humidistat, Overrun Timer & Pull Cord. 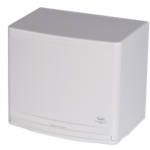 Surface mounted 100mm high performance centrifugal fan for bathroom and WCs with a range of control options including pull cord, timer, delay timer, humidistat and SELV extra low voltage. Integral grease filter. Continuously running model also available. The SF90 is a high performance centrifugal extractor fan for installation in bathrooms and WCs. Suitable for new build projects, the SF90 provides intermittent ON-OFF ventilation in line with current Building Regulation requirements and is supplied with a range of control options to suit.